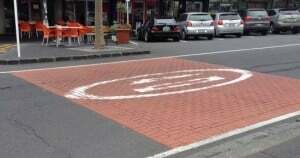 There are several types of pedestrian crossings on New Zealand’s roads, and they are designed to allow safer crossings for pedestrians, people using wheeled recreational vehicles like skateboards, rollerskates and self-propelled scooters; and people using mobility devices such as motorised wheelchairs. At pedestrian crossings there are black and white poles with orange disks or flashing yellow lights (Belisha beacons). White diamonds are usually painted on the road before a crossing and there will be a white line telling you the safe distance to stop. Pedestrian crossings are indicated by a sign such as the one above. As you approach the crossing be prepared to stop for pedestrians stepping onto the crossing, waiting to cross, or pedestrians that are already crossing. In the case of a standard pedestrian crossing with no central refuge or island, you must stop and give way to pedestrians on any part of the crossing. You can drive on when a pedestrian has cleared your lane and is walking to the other side of the road. Pedestrian crossings, which are called zebra crossings in some countries, usually have white stripes painted across the road. The approach to the crossing will often have a white diamond if the crossing is slightly obscured – note that that is different to some other countries which have zigzags or other road markings on the approach. 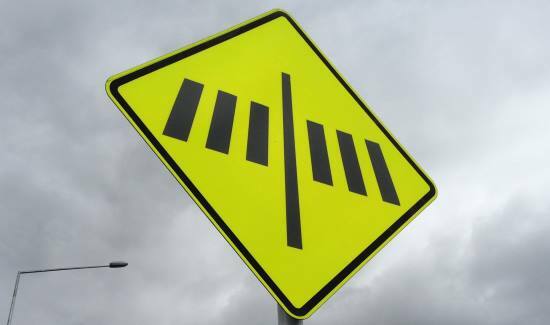 There will also be a diamond-shaped yellow sign with a pedestrian crossing symbol, as shown above. If traffic is heavy and queuing, don’t queue across a crossing. The crossing below is raised to encourage drivers to slow down before the crossing. The raised portion is marked with white triangles. The Road Code question regarding pedestrian crossings is here. 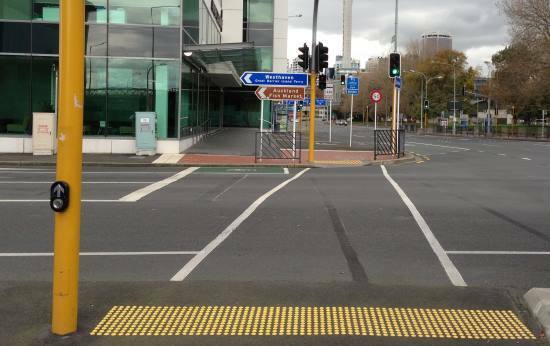 If a pedestrian crossing has an island it is treated as two separated crossings. 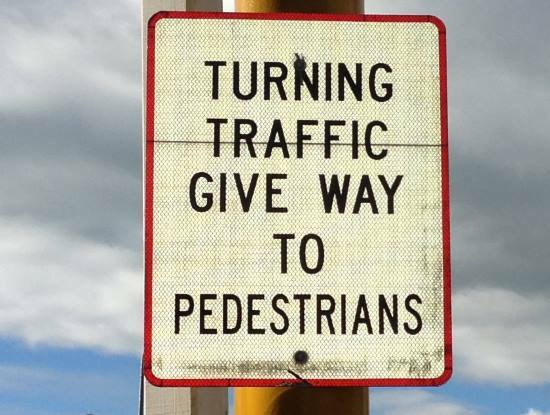 Drivers don’t need to stop for pedestrians on the other half of the road. The crossing could include a simple island, or it could be staggered where the two crossings are not continuous. A raised central island is designed to protect pedestrians, to an extent. A simple raised island provides a refuge for pedestrians in the middle of the road. Sometimes, if the road is more than two lanes, the crossing will be staggered – the two crossings are not continuous. 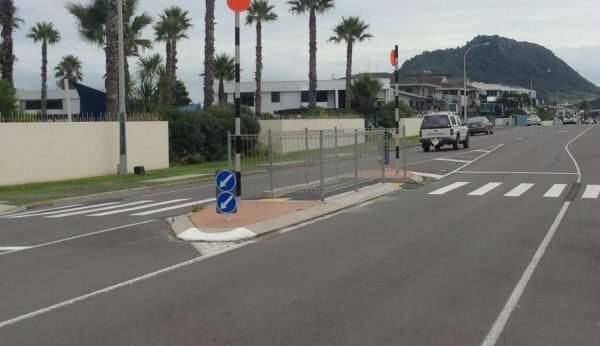 A question in the Road Code theory test regarding pedestrian crossings with raised islands is here. This is where there is a protective island in the middle of the road, but no actual crossing. 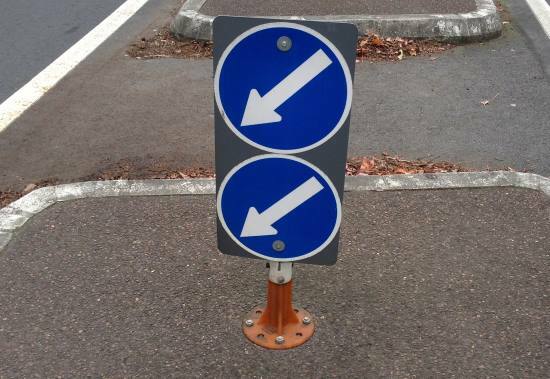 In the image below, which is on Beaumont St, Auckland, next to the Victoria Park skate ramp, there are two clear arrows instructing drivers to keep left. Courtesy crossings are often found near shopping areas. They are often made of bricks or paving and are sometimes slightly raised. The courtesy crossing can subtly direct pedestrians to attempt to cross in a specific place. In this example in Three Lamps, Ponsonby, Auckland, there’s a pedestrian crossing around 50m to the right, and a controlled crossing at the traffic lights around 50m to the left. However, because this area is used by a lot of pedestrians, they tend to want to cross the road where it’s most convenient. 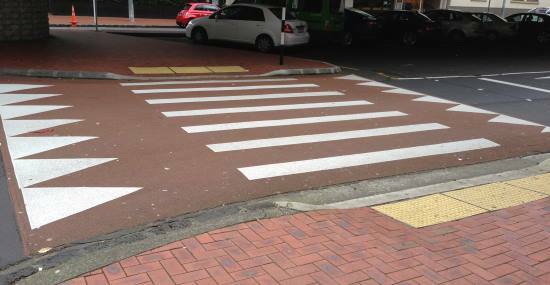 The change in the road surface and colour makes drivers aware that this is a place that pedestrians might use to cross. They aren’t obliged to stop for pedestrians, but when vehicles have to stop for the actual pedestrian crossing slightly further up the road, they tend to leave a specific gap across the courtesy crossing for pedestrians to cross. While it’s not compulsory for a driver to stop to let a pedestrian cross, it is courteous to do so. The courtesy crossing Road Code question is here. School crossings, also knowns kea crossings, are temporary crossings used just before school starts and just after school finishes. They are patrolled with Stop signs that swing out into the road. When these signs are in operation, vehicles must stop until both signs have been pulled back in. The question in the Road Code theory test about school crossings is here. A shared zone is a low speed zone in which pedestrians and vehicles share the same piece of road. Pedestrians have priority. 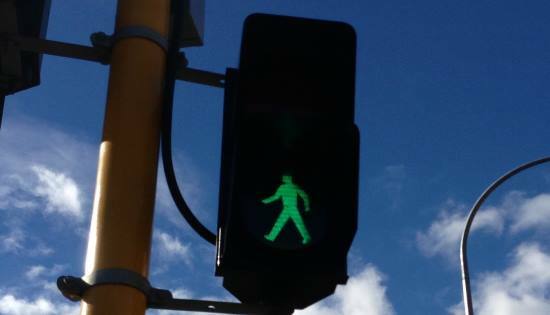 Crossings at traffic lights are controlled by walk/don’t walk signs mostly indicated by a green and red man. They often also have tactile paving and audible signals to accompany the visual signals, as shown below, for blind pedestrians. Drivers will get a red light, then the walk light will turn green. The red light will flash after a short time and this means that pedestrians that haven’t started to cross should not do so. Once the don’t walk red light comes on, the traffic lights will turn green and traffic will flow again. In junctions where a green walk light is given in conjunction with a green traffic light for drivers on a road next to the crossing, the following sign is often seen. Do you know the parking rules around pedestrian crossings? Try out our parking questions here.